There are many advantages to expat life in Bejing: it’s an exciting city going through a period of dramatic change, an international hub with many cuisines and cultures to be discovered, and a great base for exploring Asia. And although property prices often push into lists of the “world’s most expensive cities,” it’s possible to live economically, with food, utilities, and transport all relatively cheap. For families though, there is one cost which cannot be avoided: school fees. For those of us who come from countries where universal education is available free at the point of delivery, to have to find the money simply for our children to attend school can be an unpleasant shock. And it can be a lot of money. A 2016 survey conducted by ExpatFinder.com found that China has the highest school fees in the world, by some distance. Switzerland came second in the poll, but the median fees for a sixth-grade student there were over 20 percent cheaper. One factor believed to be inflating prices is the choice made by many wealthy Chinese parents to send their children to an international school, in preparation for them attending boarding school or college in the US. This increase in demand comes at a time when the make-up of Beijing’s international community is changing. While most embassies still help their staff with their children’s school fees, there are fewer employees of big companies posted here with generous relocation packages. Increasingly expats in Beijing tend to be entrepreneurs, here for the long term, to build a business and a life. Even those whose partners are mainland Chinese can find themselves having to pay for education. China does not permit dual nationality, so children with foreign passports have no rights. And for those who take Chinese nationality, the hukou system applies, and only the children of Beijing residents are entitled to a place at local public schools. It’s not all bad news though. Teachers at international schools are in a fortunate position, as many schools offer free or subsidized places to their staff, which is a very attractive addition to their package for parents. And if your child is gifted or talented, they may be eligible for a scholarship. 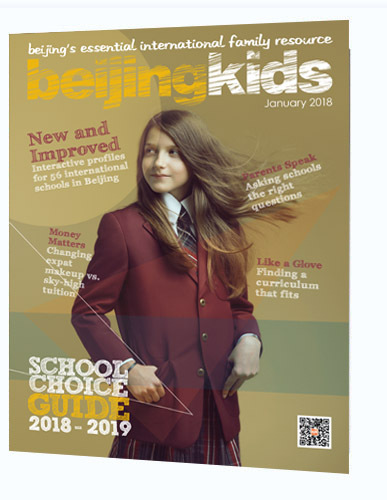 Yew Chung International School of Beijing (YCIS Beijing) is one school which offers scholarships, and we talked to Peter Bezuidenhout, Head of Admissions, to find out more. “All scholarships are funded by the school’s scholarship fund,” he told us. “One of the Yew Chung objectives is to ‘provide a holistic education that nurtures the whole person’. Offering scholarships is one way of fulfilling this objective, encouraging students to develop their academic skills, potential, and character formation. Both current and prospective students can apply for scholarships, he said. “Enrolled students should submit a completed application form, and any relevant supporting documents or materials. Students are also recognized and recommended for scholarship by teachers based on their talents, overall performance, participation, contributions, and achievements. The application is then considered by the Scholarship Review Committee, he told us. If your preferred school doesn’t offer scholarships, or your child isn’t eligible, don’t despair. If you’re really struggling, you can always just ask for a discount. Not every school will be able to offer this, as they may have policies or organizational structures which prevent them being flexible. Smaller schools though may be more amenable. One parent shared her story with us, but asked to remain anonymous, as the school in question asked her to keep their arrangement confidential. Ultimately, however, choosing a school is not like buying a tin of beans. While it’s essential to find something affordable within your family’s budget, choosing the cheapest option is unlikely to lead to a happy outcome. Quality education costs money to provide, and a child’s schooldays are crucial in shaping them as a person. However painful school fees might be, it’s an investment in our children’s future which will pay dividends in the years to come.